Increases horsepower to 280bhp. The 7th stage of upgrading includes the re-programming of engine control unit (ECU) in stage 7, the replacement of compressor, the replacement of the crankshaft pulley, the replacement of dynamo pulley, the replacement of belt with a new one with suitable diameter and strength. Also, includes the security installation in belt tensioner, the replacement of spark plugs with iridium spark plugs, the installation of a new air intake system, the installation of camshaft and cylinder head with big valves, the replacement of the exhaust system with a new exhaust manifold, metal catalytic converter and free final system, the replacement of flanges, the replacement of throttle with bigger throttle of 64mm. The 7th stage of upgrading includes the installation of chargecooler, the upgrade of the ignition system, the progress of the air intake, the upgrade of fuel supply system as well as a number of other auxiliary replacements - improvements. The pulleys are ALTRA Performance the best for MINI worldwide. 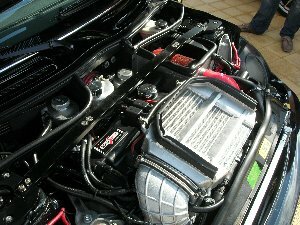 The air intake kit is ALTA Performance or M7 Tuning or aFE. Call us to arrange the receipt and delivery of your MINI. If you wish we could do the installation of 7th stage of upgrading. The installation cost is not included in price.